Whatever the season or sport, Mountain Hardwear's Mountain Tech vest is one of the few items in my gear closet that pretty much always comes along for the ride. The Mountain Tech replaces the venerable old Windstopper Tech vest, maintaining wind-blocking quality while shifting from Gore-Tex to Mountain Hardwear's 'AirShield' fleece. Additional updates include softshell reinforcements at the shoulder and collar to work better with your backpack. In either iteration, The Mountain Tech's outstanding feature is its versatility. Whatever the conditions, chances are you'll find this vest an essential part of your backcountry clothing system. Trying to maintain a stable body temperature in the mountains is always challenging. If it's windy (and it's always windy in the mountains), it's hard to stay warm, even in mild temperatures. And if it's cold, even a little wind can put you at risk for hypothermia. On the other hand, when you're climbing up a steep slope with all your gear on your back, you tend to overheat no matter what the temperature is. Overheating leads to sweating—which makes you and your clothes wet, which makes you all the more vulnerable to hypothermia. The Mountain Tech vest is an intelligent solution to both problems. You're much less likely to overheat with your arms and especially armpits exposed. Yet the Tech Vest's wind-blocking fleece keeps the wind from cooling your torso. The result? Warmth where you need it, and ventilation to keep you comfortable and dry. Compared to a shell, you get far better climate control, with equally good or better wind protection. 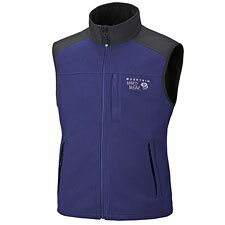 While you'll like the Tech Vest for cool-weather hiking, it is for backcountry skiing that the vest really shines. When you're skiing you create your own wind. I prefer having a vest on when I'm skiing to keep that wind from cooling my torso. The Tech vest is light enough and versatile enough to work perfectly in this context. Highly Recommended!